The new zero-emissions BYD buses boast a range of up to 190 miles with 81 passengers on a single electric charge. The double decker bus is 33 feet long. Transport for London (TfL) is making a bold move with the introduction of the world’s first zero-emission, long-range, allelectric BYD Double-Decker buses into revenue service routes. TfL celebrated the historic decision to deploy its first all-electric double decker buses with a special ceremony at London city hall this week with London’s Deputy Mayor of Environment and Energy, Matthew Pencharz formally receiving the first bus from BYD Europe. TfL and Metroline will receive support from BYD with the installation of fast charging equipment at Metroline’s Willesden Bus Garage in north London. Additionally, BYD will provide driver training for the bus operators. BYD, the world’s largest electric vehicle manufacturer, designed and developed the vehicles to Transport of London’s specifications. The five buses scheduled for deployment are more than 33 feet long and feature air conditioning, seats for 54 passengers with space for 27 standing passengers (81 total). 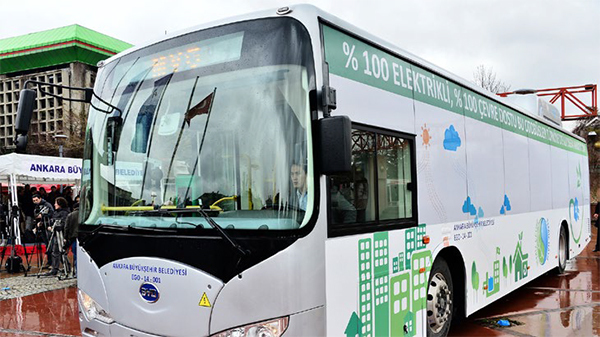 The buses are equipped with BYD-designed and built Iron- Phosphate batteries, delivering 345 kWh of power that come with an Industry-benchmark 12 year battery warranty, the longest electric battery warranty available. The batteries can power the bus for over 24 hours and up to 190 miles of typical urban driving on the service routes with a single daily recharging requiring only four hours. TfL plans to charge the buses overnight using low-cost, off-peak electricity to provide additional cost savings. In Paris BYD held a preview for world’s first pure electric coach. Public transport operators and authorities in Paris became the first people in Europe to see the world’s first pure electric coach. Developed by BYD, the coach could transform another city vehicle market which impacts on air quality. With a range of 200km under typical operating conditions and a recharge time of only 2.5 hours, the all new BYD coach could complete many coaching applications in and around cities – such as shuttle services, city sightseeing, hotel and airport feeder services.